Supply chains in today’s economy require efficient and flexible warehousing solutions. The traditional laws of demand and supply no longer apply. This is partly due to the effect E-commerce has had on the Market. Most E-commerce companies want their product closer to the customer for better logistics. With this in mind, Logistics providers can embrace the new operating environment by making use of temporary warehouses. Why Choose Temporary Warehouses for Your Logistics Business? Periodical Needs-How long do you need the warehouse? Sometimes you may not be sure for how long you need a warehouse. How long will it take for goods to arrive? The client can also change their needs. Such situations may require the deployment of temporary warehouses. They are flexible and can be scaled up or down in a short period of time. A logistics company may handle different types of goods. Some require chilled conditions some are sensitive to light yet even others require specialized mechanisms like conveyor belts, heavy lifting equipment or rolling entrances. Temporary warehouses can be altered and molded quickly to accommodate rapidly changing needs. Mobile Warehouses-You need to move storage geographically. The ability to move warehouses to different locations can help logistics companies reduce costs. Clients are located in different locations. You can move temporary warehouses to locations they are needed at any time. Given that the volume of goods handled varies depending on the amount of business, there is a need for warehouses that can be shrunk when loads reduce and quickly expanded when loads increase. This is quite normal in today’s logistics environment. For instance, certain periods of the year like Black Fridays and Christmas are characterized by sharp spikes in loads handled. Temporary warehouses provide this type of flexibility. A logistics business does not have to tie up its capital in the construction and maintenance of warehouses. Sometimes you may need to lease or hire temporary warehouses as you concentrate on the core business of moving goods. In many cases, logistics companies need to operate in the land that belongs to the client. This is to reduce the number of stops required for goods to be delivered. This way, the goods are delivered directly from the source to the destination. Temporary warehouses are perfect for these arrangements as they can be dismantled and moved elsewhere in case a contract is completed or terminated. Certain situations may require a logistics provider to have additional space delivered fast. This could be due to new business, increase in business, renovations or even as a reaction to emergencies brought about by external elements like natural disasters. Containers are sometimes held up in transit when routes are disrupted for various reasons. 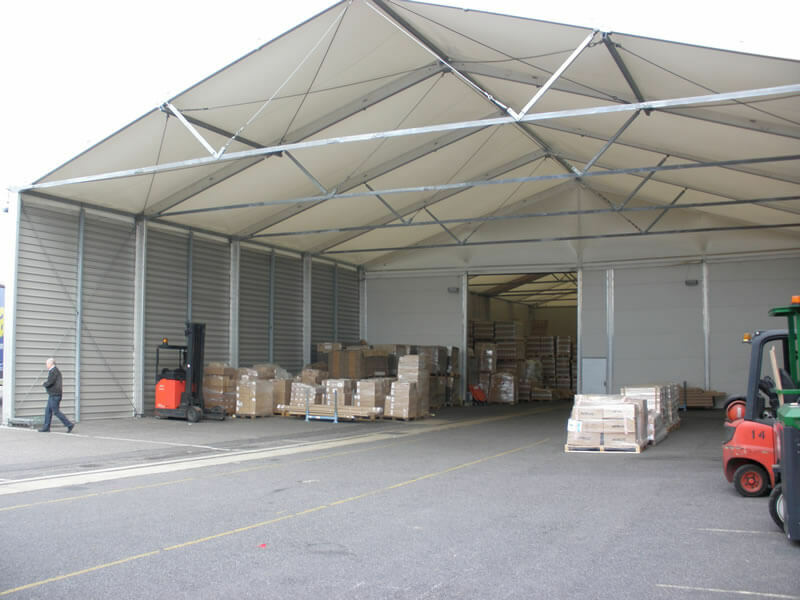 In such situations, a temporary warehouse can be put together in a matter of days. There has been a revolution in the marketing and sales of products that call for ever more flexible and on-demand warehousing solutions. Warehousing Engineering solution providers no longer have to play catchup and Smart space has been at the forefront of innovation in reinventing the warehouse. Traditional brick and mortar warehouses no longer address today’s needs, hence the need for versatile and highly flexible temporary storage solutions.